The Religious Education Curriculum includes a service-learning component for seniors. Those who choose to apply for this course and are accepted will spend one semester visiting four sites each week. These locations include elder facilities, preschools, elementary schools, and a variety of community locations. 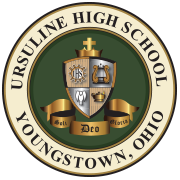 Listed below are many of the sites Ursuline students have enjoyed during the past several semesters. Included in their work for this course is an on-site evaluation from their supervisors, excellent attendance, and academic assignments in order to receive their religion credit. Each student keeps a daily journal of his or her reflections for their service work. A research project on a topic, which relates to one of their locations, a storytelling project for the children at their preschool, in-class discussions and in-service training, elementary sign language, and reflection papers on videos comprise the curriculum for this course. 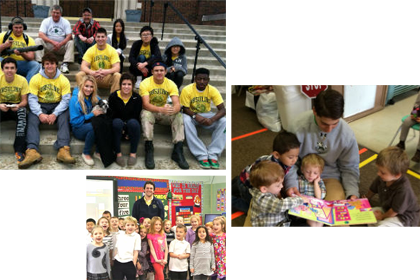 Students of Stewardship is an extracurricular service organization dedicated to serving various local charities including the Rescue Mission, Habitat for Humanity, and Casa Madre, among others. They also raise money throughout the year to defray the cost of their culminating activity, a mission trip to an area in need, such as Appalachia. Students in grades 9 through 12 are welcome to join S.O.S., although the Mission Trip is open to only upper classmen. Another extracurricular service organization is the Interact Club, which is affiliated with Rotary International. It is open to all students who wish to enhance leadership skills, serve their community and expand international understanding. Projects address today’s most critical issues such as hunger, the environment and illiteracy.